If you have not watched last night’s Grey’s Anatomy and don’t want to know how it ended, STOP READING NOW. This is your official SPOILER ALERT. I have a video of the beginning of next week’s much-talked about musical episode embedded below. It picks up exactly where last night’s episode left off. This is your final WARNING. 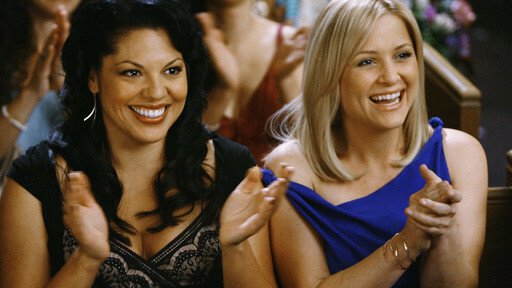 Following their baby shower, Callie gives Arizona a weekend getaway at a B&B just for the two of them. As they head out into the wilderness, Callie gets a text from Mark. And while Arizona has been handling the Mark situation fairly well, she has reached her breaking point, taking the phone and throwing it into the back seat. At which point, Callie unbuckles and retrieves. Then, Arizona catches her off-guard by proposing – as a way of finding her footing in this delicately-balanced triangle. And then… BAM!! They run into a truck.